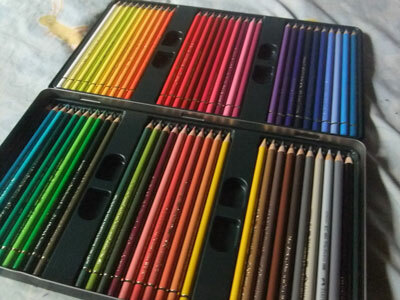 Daughter got this expensive colored pencil from his cousin Kuya Gladden. The name POLYCHROMOS®, meaning “many colors” was born in 1908 and became known across several continents. 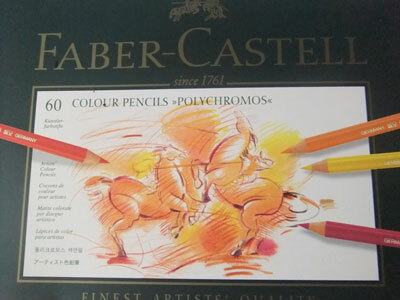 Today the name still stands for best of class quality including; unsurpassed lightfast pigments, 120 vibrant colors, break resistant tips, waterproof, non-smudge, and color matched to all other Faber-Castell lines. This set is expensive, too ($150 or more than P6,000 here). We can only afford the regular colored pencil of Faber Castell, but not this set. My daughter is really thankful for the generosity of her Kuya Gladden. She was very happy when she opened the package as if she received fantasy trophies for the gift. This entry was posted in Art Stuff and tagged faber castell color pencil, polychromos on September 14, 2012 by Yami.